Boynton Beach's Growing Arts Scene Keeps Things "Fresh And Green"
As one of the key players behind the up-and-coming Boynton Beach Art District (BBAD), artist and gallery owner Rolando Chang Barrero is getting no down time during South Florida's "off season." Barrero is among the region's year-round residents who stick it out during the slow, sultry months to ensure his pet projects make it through to grow another season. Artists will work to repaint the bay doors in the Boynton Beach Art District with colorful murals as part of an ongoing public exhibition. "It's time to get the community to really step it up if we're going to become a year-round arts scene," said Barrero, who owns ActivistArtistA, which serves as something of a launching pad for many of the BBAD projects. This weekend provides multiple opportunities to experience and participate in what's shaking in the Palm Beach County artists' enclave, which is located in a slowly-but-surely transforming industrial park. In addition to a regularly-scheduled open mike night on Thursday, the neighborhood will host three separate but complementary events throughout the weekend. In the continuing effort to reinvent the once "blighted" industrial area, Barrero is teaming with local raw chef Nina Kauder for an entirely new component: an urban garden to be set along the fence-line in BBAD. The first "Greening the Park" event is from sunrise to sunset on Sunday and volunteers are welcome. Barrero said the project will begin with the removal of the topsoil in case of contamination (this is an industrial area, after all) and a re-building with organic topsoils. In the first phase of the project, volunteers will plant sunflowers, pigeon peas, and other summer-hearty plants. Eventually, Kauder and Barrero would like to see people growing and eating food on site, ideally in its raw state. There are hopes for an on-site raw juice bar at some point in the future. Interested volunteers for Sunday's work day can email BoyntonBeachArtDistrict@gmail.com. Earlier in the weekend is "Paint It! An Urban Affair," part of the ongoing ActivistArtistA bay gates project, wherein local artists contribute to an ever-evolving outdoor exhibition of colorful murals. Outdoor "canvases" -- walls and metal bay doors -- will be prepped on Friday and artists will begin work at 6 p.m. on Saturday and continue throughout Sunday. Among the 14 artists are Eduardo Medietta, Caron Bowman, and many others. Barrero hopes the diversity of offerings will help to keep the district and surrounding community invigorated throughout the year and even through the dog days of summer. "It's good for Boynton Beach," Barrero said. "We don't want the momentum to die that started last year. 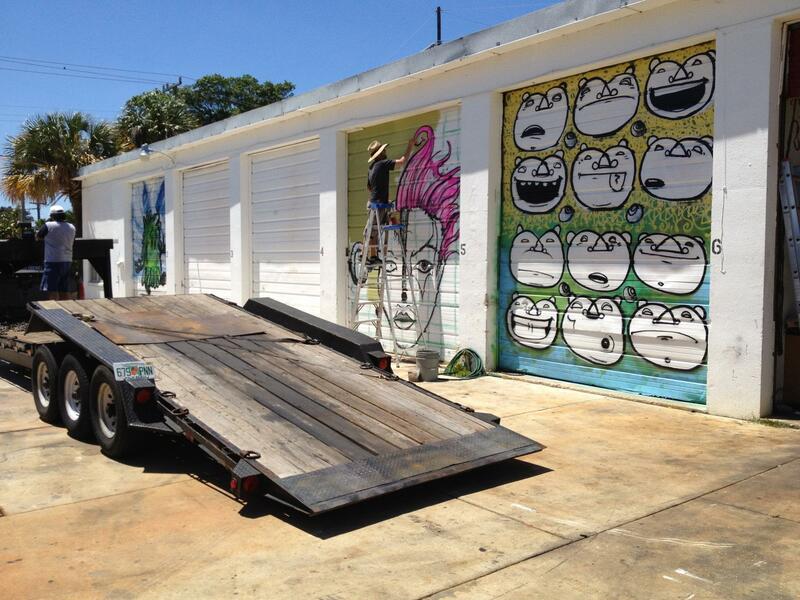 We want to keep it fresh, keep it green, and keep the Boynton Beach Art District on the map." KeroWACKED Multimedia Festival Is Sunday In Palm Beach County's "Art Mecca"
Rolando Chang Barrero is floored by what is happening in the Boynton Beach Arts District, and that's a good thing. "There is a lot going on," Barrero said.